Shown in the video is a Nagakkalam, a drawing of the Serpent God. Nagakkalam is drawn by the Pulluvas to appease the serpent gods. Pulluva is a community in Kerala practicing snake worship. The male member of the community is called Pulluvan and the female member is called Pulluvathi. Pulluvan Paattu literally means ‘song of the Pulluva’. Nagakkalam is drawn in Sarppakkavus, sacred groves meant for snake worship. These groves are found in temples and ancient homes. The rituals start in the evening with the drawing of the Nagakkalam. Red, green, yellow, black and white are the colours and only natural derivatives are used to make the colours. 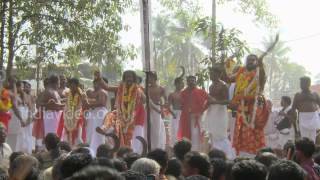 This is followed by a series of rituals that conclude with Sarpam Thullal. In Sarpam Thullal, unmarried females are let to sit in the Kalam. The Pulluvan and Pulluvathi start singing in praise of various gods and the girls go into a trance and start erasing the Kalam. Pulluvan Kudam and Pulluvan Veena are the two musical instruments played by the Pulluvas during the ritual. The Pulluvan Kudam is an earthen pot to which two leather strings are attached with the help of a piece of bamboo. The strings are played rhythmically and the pot serves as an amplifier for the sound. The Pulluvan Veena is a short fiddle with just one string and it is played with a bow.